Wouldn’t it be lovely to have the flexibility to pick and choose what hours you want to work? It would make it easier for you to maintain a healthy balance of life and work for many years to come. Here are 5 home based call center jobs that offer flexible scheduling that I want to share with you. Please Note: I cannot assure you that all these companies are hiring at this time. Please bookmark this page for future reference. Below you will find a list of home based phone jobs you can do at your own time. If you are interested in more ways to work from home that will give you the flexibility you need, check out this post. 1. Live Ops – Read Review – This is a virtual call center that offers great flexibility as long as you work a minimum of 10 hours per week. You would be handling inbound calls from people who after watching infomercials, or listening to radio ads, call to ask about a specific product or service. The pay is around .25 per talk minute. 2. Alorica at Home – Read Review – This company is now known as Alorica, is very similar to LiveOps because it allows you to work flexible shifts and also trade your hours with other agents that may want to pick up extra hours. You would be handling inbound calls in customer service, sales, billing, surveys, and technical support. Payment is on a per – call or per – minute basis. However, if you do not get the call required, you will be paid the minimum wage for your state. 3. ACD Direct – This is another virtual call center that offers flexible scheduling and you are even able to work when you are not scheduled to pick up additional hours. You would be handling calls from non-profit organizations during their pledge campaigns. ACD Direct does not have a steady workflow but have peak seasons when they get very busy. You will need to work a minimum of 10 hours a month to remain active and the pay can vary from $0.25 to $0.30 per talk minute. 4. Expert Planet – This company offers flexible shifts in which their agents handle inbound calls and help callers that are already interested in a particular product or service. The position requires a person that has sales experience if they are to become a top performing call center agent, as here is no “Cold-Calling” involved. To apply you would basically need to fill out their online application and if you are a good match, you will be invited to start the application process. All applicants must be taken through a complete a background and credit check before starting on a one -week certification class. The pay varies depending on what client you are taking calls for. 5. Great Virtual Works – This call center contracts agents to work from home and offers flexible hours as long as you work a minimum of 15 hours a week. The pay is around $15 per hour for the customer service position, and $10 per hour for the Inbound Sales position. Looking for More Phone Jobs? 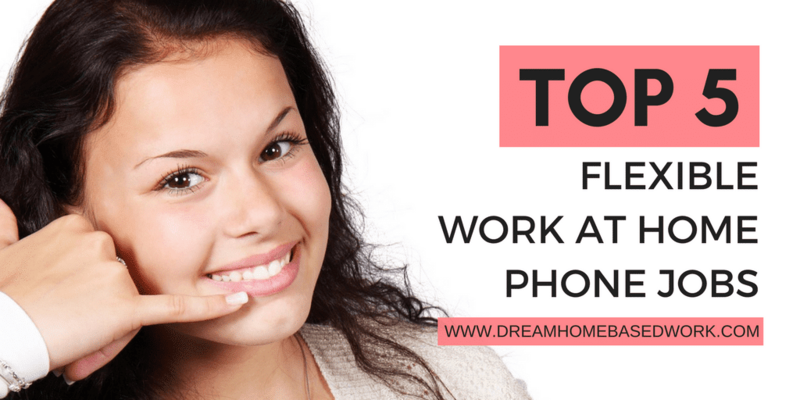 We have a big list of 57 home phone jobs you can apply with today. I also recommend following us on Facebook to learn about other work from home jobs that don't involve being on the phone.